The Alcraft GT has been identified by the world’s leading luxury title, the Financial Times’ supplement How To Spend It, as one of a vanguard of luxury, high-performance electric cars heralding a new world of exciting electric driving. The feature puts Alcraft and the “lithe and muscular” GT alongside Aston Martin and its first EV, the yet-to-be launched RapidE; Jaguar’s similarly in-development iPace SUV; the Mercedes-Maybach Vision 6 concept car; Nio’s EP9 supercar concept; Rimac’s Concept One supercar; and other performance cars still in development from Detroit Electric and Lightning. 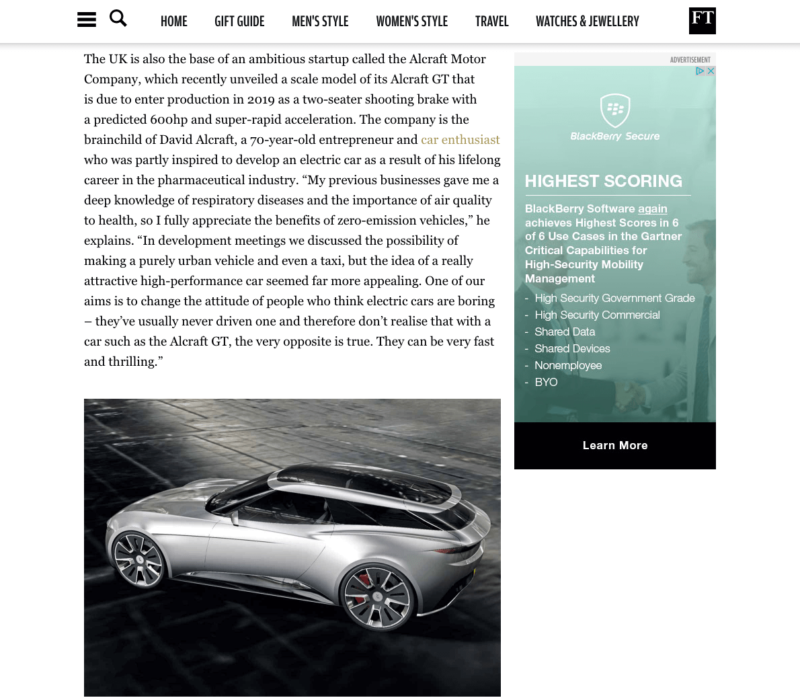 Written by How To Spend It’s motoring expert Simon de Burton, the piece highlights not just the inherent performance capability of electric vehicles but also the fact that the simplicity of battery-only EVs lends them to a contemporary sense of luxury as hushed, responsible and cool, as well as the lead being taken in this space by new, focused brands and the most agile and forward-thinking large carmakers.